A rhubarb granita cools and refreshes, combining the childlike joy of a frozen dessert with sophisticated, tart rhubarb flavours. Unlike sorbets or ice cream, granitas do not need to be churned and can be made in any household freezer. The blush pink ice makes a beautiful dessert, palate cleanser or a simple snack on a sunny day. 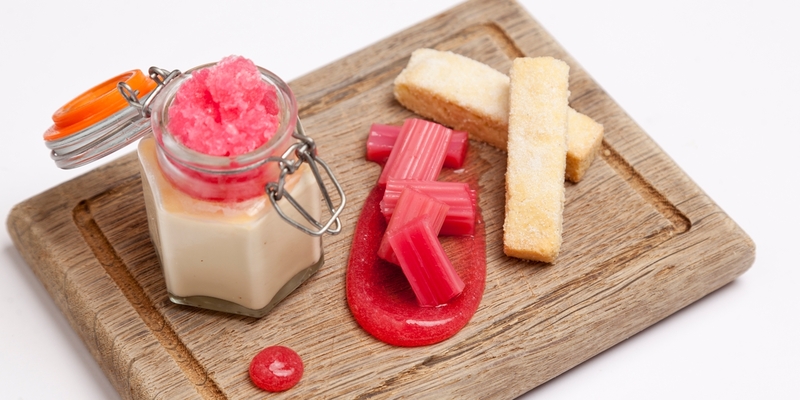 Emily Watkins tops a baked custard with rhubarb granita for a playful twist on ‘rhubarb and custard’. Just as Watkins uses it as a layer, a strongly flavoured granita is a good way of introducing new flavours to an ice cream sundae or frozen dessert. Rhubarb granita makes a delicious and refreshing dish in its own right, and would make a lovely summertime palate cleansing course served in a shot glass.